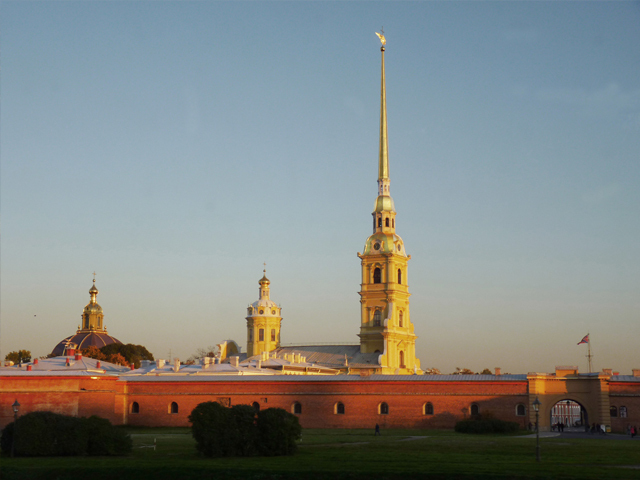 Peter and Paul Fortress | Sightseeing tours and Shore Excursions in St Petersburg! 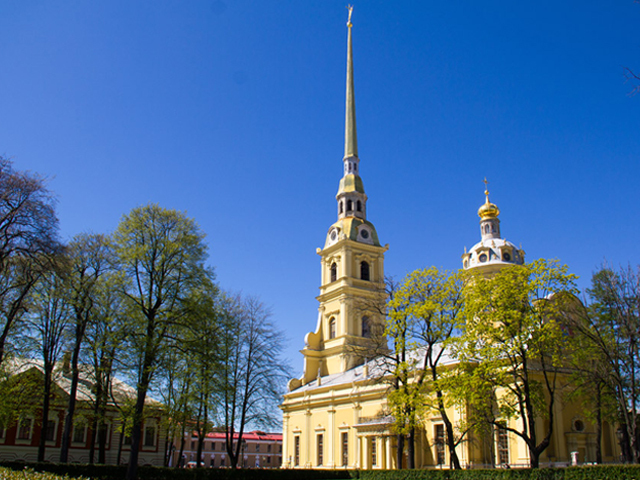 Visit Peter and Paul Fortress in St Petersburg with a private guide and learn about its rich history on a 2-hour walking tour! The sprawling site is fascinating to explore, with old prison buildings and an ornate Baroque cathedral. 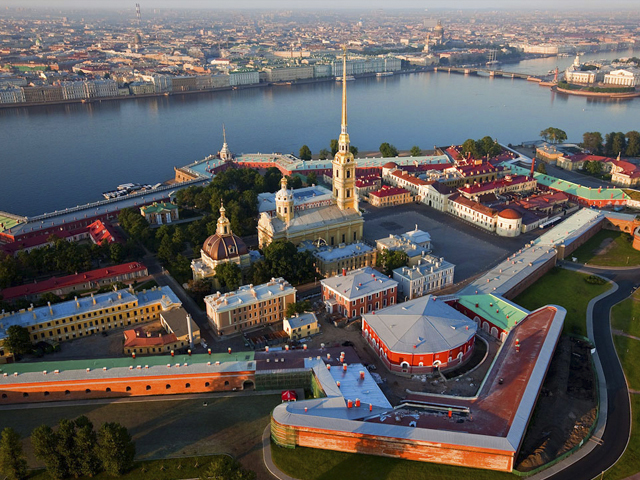 Visit Trubetskoy Bastion, a prison-turned-museum and gaze in awe at the extravagant interior of Peter and Paul Cathedral where Tsar Peter the Great is buried. Monday: 10.00 a.m. - 18.00 p.m.
Sunday:	10.00 a.m. - 18.00 p.m. The fortress has become one of the city's main attractions thanks to its many historic buildings. In 1703, when Peter the Great reclaimed the lands along the Neva River, he made a decision to build a fort to protect the projected capital city from attack by the Swedish army or navy. He chose tiny Hare Island in the Neva Delta for the fortress's location, and the citadel, with six bastions in earth and timber, was completed in less than a year. From 1706 to 1740, the fort was rebuilt in stone and less than thirty years later it was completely clad with granite. The fortress never really saw any action because the Russians had defeated the Swedes before its completion. So, instead, it was used as a garrison and a jail for political prisoners and there was also a torture-chamber. 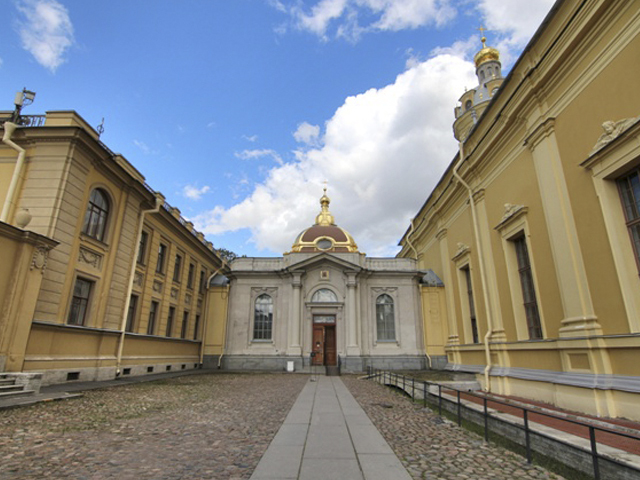 From 1721 onward, it housed a number of notable personalities, including Peter the Great's son, Alexei, who was executed here after being tortured by his own father. Other well-known individuals jailed there through the centuries have included Fyodor Dostoevsky, Tadeusz Kosciuszko, Leon Trotsky, Maxim Gorky and Alexander Lenin, brother of Vladimir. The fortress was, however, attacked during the February Revolution of 1917 and later that same year fell into the hands of the Bolsheviks. By 1924, most of the fortress was converted into a museum but much of it was heavily damaged during World War II. It was restored after the war. To enter the fortress, visitors cross the St. John's bridge, which leads to the St. John's Gate, also referred to as Ivan's Gate. A second gateway awaits, the more ornate St. Peter's Gate. It was built in 1714-1718 after a design by Domenico Trezzini and replaced an original wooden gate. The gate resembles a triumphal arch and is decorated with a depiction of the imperial coat of arms, a crowned, double-headed eagle. After passing the gate one enters the actual fortress, with the engineer's house on the left and the Artillery arsenal on the right. 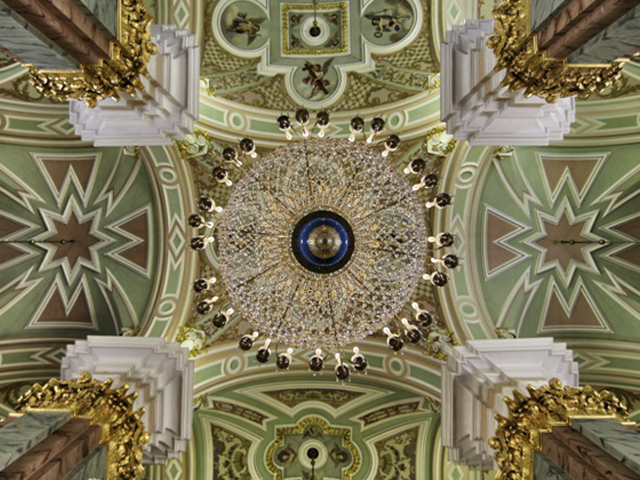 Ahead is the centerpiece of the fortress, the Peter and Paul Cathedral, with its 122.5 meter (+400 foot) tall gilded spiral with a golden angel perched on top. The cathedral, designed by Domenico Trezzini, is one of the city's most important landmarks. 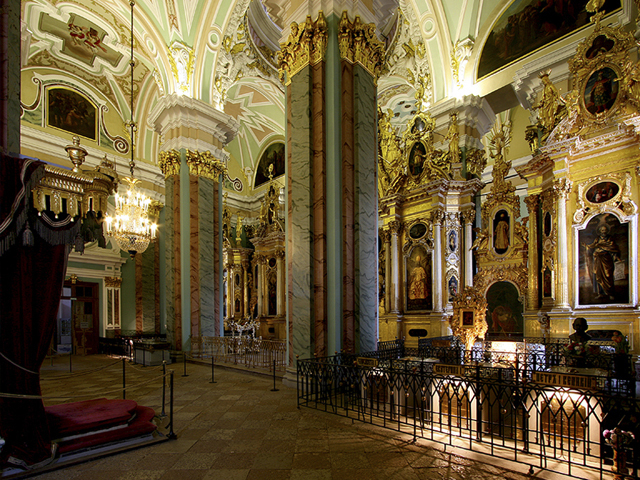 Construction of the church started in 1712 and it was consecrated twelve years later, in 1724. The structure was heavily damaged in the mid-eighteenth century due to a fire caused by lightning. It was slightly remodeled and reconstructed in 1776. 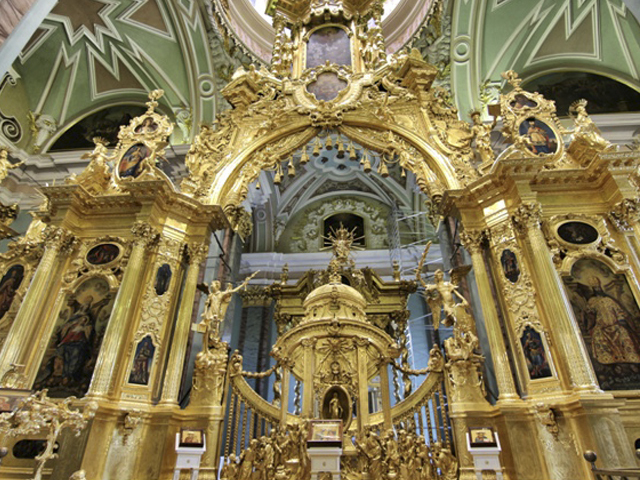 The ornately decorated cathedral with many magnificent iconostases has been the burial place of all Russian Emperors and Empresses from Peter the Great to Alexander III. Other buildings onsite include the Grand Ducal Mausoleum, where several more-recent grand dukes and duchesses have been interred; the small Boat House, where you can buy tickets to access the cathedral; the House of the Commander, where the commanding officer of the fortress lived; the Mint, one of only two in Russia where coins and medals are made; and the City Museum (in the engineer's house), which provides some interesting background on the history of St. Petersburg. The beaches located underneath the fortress walls are quite popular with locals and are usually crowded on warm, summer weekends. But even during wintertime people lean against the walls to bask in the sun during the brief periods of sunshine. The brave - known as walruses - even break the ice and swim in the freezing water.